The Dominican Justice Promoters of North America met on June 27th to 29th in Des Plaines, Illinois to renew its mission and direction. 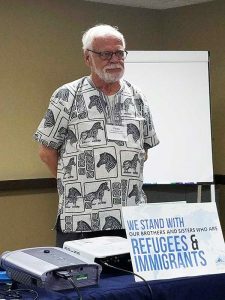 Thirty-three participants gathered from California, Washington State, Illinois, Michigan, Indiana, Missouri, Kentucky, New Jersey, New York and other parts of the United States. 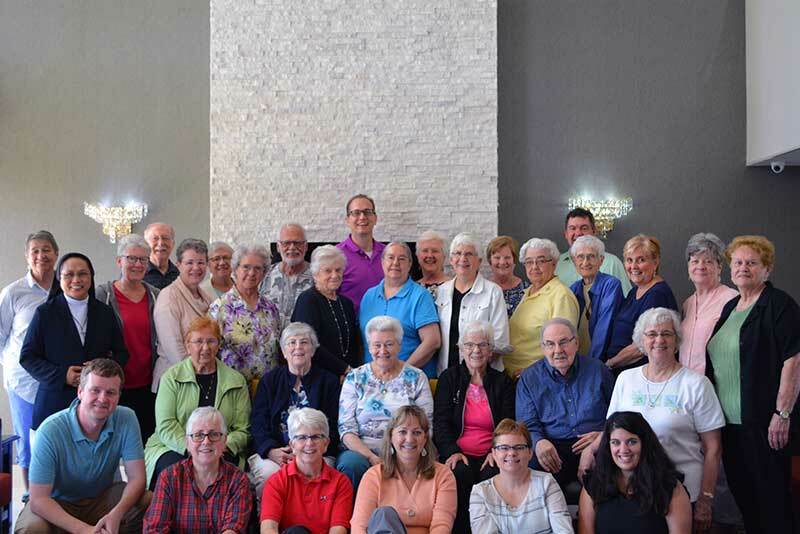 We were proud to have a more inclusive representation of the Dominican Family of North America with representatives of the friars of Canada, Dominican Laity and Province and Congregational Representatives joining our annual meeting. Joining us were Communicators: Stacy Spitler of Grand Rapids, Angela Kessler of Adrian, Kate Martin of San Rafael, Gina Ciliberto of Hope and Michael Wilmsen of the Central Province. Representatives of the Dominican Laity were Joseph Komadina, (Central Province and North American Representative of the International Council of Lay Dominican Fraternities) and Jo Ann Cotterman (New Orleans). We were join by Yvon Pomerleau, Justice Promoter for the Canadian Province of Friars. 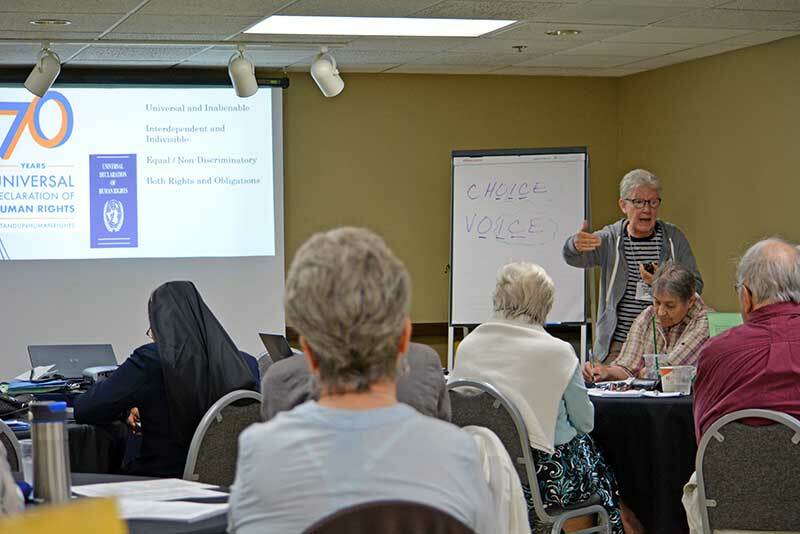 Cecilia Espenilla, OP, Dominican Sisters International Justice Promoter and Margaret Mayce, OP, (Amityville) Dominican representative at the United Nations in New York shared about broader Dominican efforts. Pat Farrell, OP (San Rafael), the Executive Director of the Dominican Sisters Conference joined us. Our facilitator was Patricia McDonald, OP (Adrian Dominican). Along with the solidarity and commitment that result from these gatherings, the meeting focused on connecting with communicators to enhance the justice efforts and utilizing our collective Dominican voice and action. While there are many points in communicating the justice work and message, communicators stressed the planning and collaboration needed to make that happen. Knowing our own priorities, resources, and audiences helps to craft more meaningful messages. Promoters will continue to address and lift up truth in the areas of climate justice and the oneness of all creation, nuclear weapons, gun control, justice for Palestinians, immigration education and advocacy, human trafficking awareness, the notion of the common good, and economic justice. Each promoter – and members – cannot address all of the issues. The group realized that there would often be specific issues for congregations, provinces, or regions. From the meeting’s deliberations, the group committed to compile a 2019 Dominican Family report on the United States’ efforts for meeting the Sustainable Development Goals (SDG). The SDG’s were agreed to by the nation members of the United Nations and came into effect January 2016. Nation reports are voluntary and, as of yet, the U.S. has not submitted a report. Margaret Mayce, OP, will prepare an outline for our involvement over the next months. In solidarity with the world-wide Dominican Family, the promoters will join in the second International Dominican Month for Peace, December, 2018. Our prayer will be for the Democratic Republic of the Congo. More information will follow on this initiative. The promoters left the meeting with a number of tasks, knowing that the ongoing reality of promoting justice in our world is the focus of our energy and hope. We realize our generation of Dominicans is on an important journey of living the life of truth and justice in our world today in the great tradition of Antonio Montesinos, Dominic, and Catherine. « Dominican Sisters of Amityville: ‘Sister Gina Fleming, OP Wins the Sister Pat Brady Award’	» Faith and Film: Won’t You Be My Neighbor?